I, like nearly all editors, require my clients to sign a contract prior to beginning work on a new project. Contracts vary greatly from editor to editor, and a single editor might even use different contracts for different types of work. 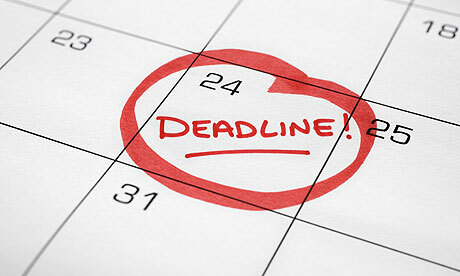 There is one thing that all contracts have in common, however: deadlines. For all of these reasons, deadlines are important for both clients and editors. To keep your editor happy–and ultimately, to keep yourself happy–it’s critical to abide by the deadlines that you agree to. If your editor offers you a contract with a deadline that you won’t be able to meet, don’t sign it. Instead, ask the editor to revise the contract to include a deadline that work for you. It’s generally not a problem to do this, and your editor would much rather draft a new contract and schedule you at a more optimal time than have to squeeze you in when you miss a deadline. Your editor would also rather draft a new contract than have an awkward conversation about why you owe some additional money when no additional work was performed. On that same note, let your editor know right away if unforeseen circumstances arise that will prevent you from meeting a deadline that you agreed to. As noted above re: visiting Grandma in the home and sleeping in on Saturdays, editors are human. We understand that clients sometimes have car accidents, unexpectedly lose friends or loved ones, and have children who get concussions. We’re compassionate and we’ll do what we can to work with you–we try our best to treat clients the way we’d want to be treated. (It’s the right thing to do, but it’s also a good business practice.) If you’re good to us, we’ll be good to you, and if you let us know what’s going on as soon as you can, we’ll do our best to accommodate you.